North Korea is seeking support from the Association of Southeast Asian Nations to prevent a potential “nuclear holocaust,” as US President Donald Trump warns of the possibility of a “major conflict” in the Korean Peninsula if diplomacy fails. Washington’s actions and rhetoric are pushing the region to the “brink of war,” North Korean Foreign Minister Ri Yong-ho wrote in a letter to ASEAN’s chief Le Luong Minh from Vietnam. “As you know, due to the annual war games in South Korea conducted by the United States and South Korea, the situation in the Korean Peninsula is out of control,” the letter, seen by AFP and dated April 23 reads. Pyongyang penned the letter just ahead of the 30th Asean Summit taking place in Manila on April 26-28 in which it also justified its effort to develop its own nuclear arsenal as the only means of a deterrent against the United States. North Korea’s chief diplomat urged the ASEAN chief to inform the 10-nation organization's foreign ministers “about the grave situation” and to develop a “proper proposal” on how to preserve peace on the Peninsula. “I express my expectations that ASEAN which attaches great importance to the regional peace and stability will make an issue of the US-South Korean joint military exercises at ASEAN conferences from the fair position and play an active role in safeguarding the peace and safety of Korean Peninsula,” Ri Yong-ho wrote. This is not the first time that Pyongyang has sent a letter to the 10-member regional body of which North Korea is not a member. The official North Korean news agency, KCNA, reported that its foreign ministry sent a dispatch to the ASEAN Secretariat on April 4, in which they also addressed the issue of the war games being conducted by the US and South Korea. The North Korean plea to ASEAN comes amid escalating tensions in the region. 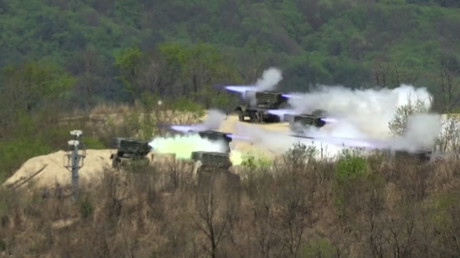 Just this week, the South Korean and US militaries held a combined firing drill in Pocheon featuring dozens of tanks and fighter jets. The military exercises came only a day after North Korea held its own firing maneuvers in Wonsan. The US has meanwhile launched its Minuteman III ICBM to demonstrate its “nuclear capabilities.” In addition, a US nuclear submarine armed with guided missiles made a port call in South Korea on Tuesday, while a carrier strike group led by the USS Carl Vinson approached the potential conflict theater. 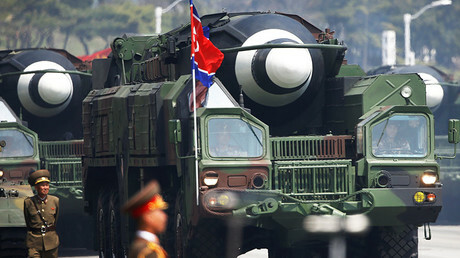 On Friday, South Korea’s Ministry of National Defense announced that the US plans to continue deploying its "strategic" weapons to the country, Yonhap reports. The two sides agreed to push for "measures available in all aspects including the regular deployment of US strategic assets," the ministry said commenting on the two-day Korea-US Integrated Defense Dialogue (KIDD) meeting held in Washington DC. While the US continues to pursue ‘peace’ through boosting its military force in the region, China and Russia are urging for a diplomatic solution. Beijing is trying to pressure North Korea not to conduct a sixth nuclear test which many believe could spark retaliatory action from Washington, similar to the one seen in Syria, when Trump ordered a strike on a Syrian air base in retaliation to an alleged sarin gas attack in Idlib. On Thursday, US Secretary of State Rex Tillerson said China agreed to impose unilateral sanctions should Pyongyang carry out another nuclear test. “And in fact we were told by the Chinese that they informed the regime that if they did conduct further nuclear tests, China would be taking sanctions actions on their own,” Tillerson told Fox News without elaborating. In February, China banned coal imports from its neighbor and raised the possibility of restricting oil shipments to the North. Donald Trump meanwhile told Reuters that there is “chance” of a major conflict in the region. Earlier in the day, Russian President Vladimir Putin and Japanese Prime Minister Shinzo Abe advocated a diplomatic solution to the Korean crisis. “We call on all states involved in the region’s affairs to refrain from military rhetoric and seek peaceful, constructive dialogue,” Putin said after meeting Abe at the Kremlin. A day earlier, Russian Foreign Ministry spokeswoman, Maria Zakharova, insisted that the six party talks should be revived. “There is a mechanism, six-party talks, and the question is not for Russia. The question should go to the United States (as to) why they have rejected this mechanism of improving the situation in the Korean Peninsula,” Zakharova told Yahoo news. “We should use all the diplomatic efforts and all the possibilities of international law which we have on the table,” Zakharova added. 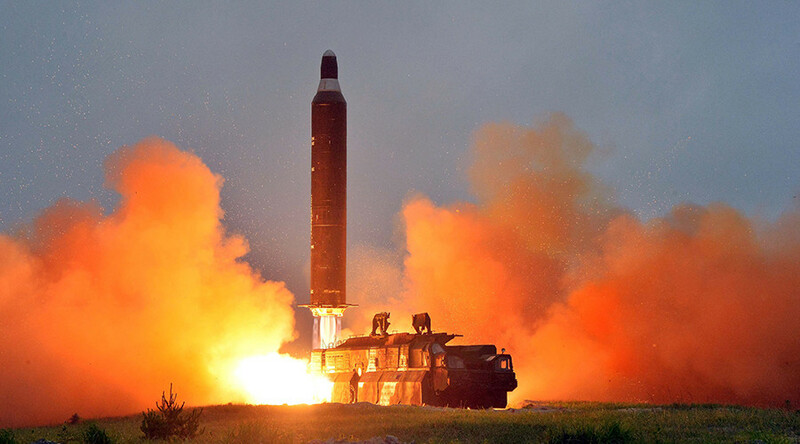 The six-party talks involving North and South Korea, China, the United States, Japan and Russia collapsed in 2008 following a rocket launch by North Korea. The multilateral negotiations were aimed at achieving a complete denuclearization of the Korean Peninsula.